AL McCABE and Jason Goodson share a special bond of mateship borne from an understanding of how dramatically life can change. In 2002, Al was there for Jason when he was involved in a tractor accident on a property at Bonville. Just weeks after the accident, in which Jason lost his arm, Al suffered a spinal cord injury on the rugby paddock that left him a quadriplegic. Goodenough, who found me after the accident," Jason said. they stayed with me and called an ambulance. "After I lost my arm, I thought I had lost so much in life, then after Al's accident, I realised just how lucky I had been." In the decade since their lives were changed, both men say their friendship is deeper and closer, as a result of their shared experiences. "Yeah, every day I count myself lucky. I have got to watch my children grow up and that is what matters most," Al said. 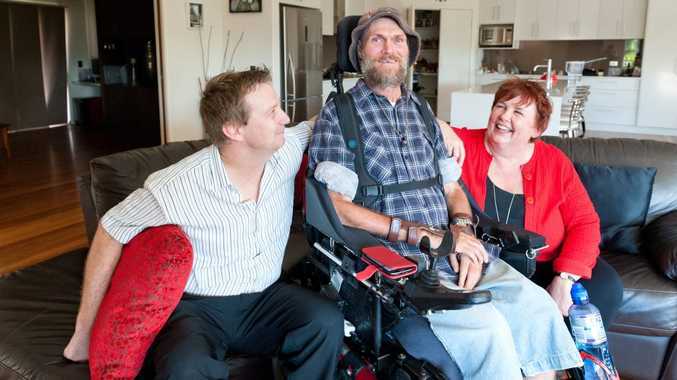 Through their association with Al, Jason a practising injury law adviser with Slater and Gordon and his work colleague Heather McKinnon have been strong supporters of Spinal Cord Injuries Australia. As a fundraiser they will stage a charity screening of the film The Intouchables at Birch Carroll and Coyle at 6pm next Wednesday. "We hope to raise enough to enable a spinal cord injury patient and their family the opportunity to enjoy a holiday away from home," Heather said. "Often it is just not practical or affordable for many people living with spinal cord injury to enjoy this luxury. 'The Intouchables' celebrates the friendship between a quadriplegia man and his unlikely carer. Tickets are $20 and can be purchased through Slater and Gordon or by calling 6651 8440.